Fleet: 12 Boeing 757s and one 767. Ten Next-Generation 737s on order for leasing venture, with delivery starting in 2006. Two 787-8s scheduled for 2010 delivery. When it comes to real estate, it's all about location, location, location. And Icelandair, which for more than five decades has served as a bridge between North America and Europe, has used its geographically blessed North Atlantic locale to full advantage. This island nation of 290,000 people—with a population smaller than cities such as Wichita, Kan., and El Paso, Texas, where Boeing sites are located—has become a popular stopover and tourist destination for transoceanic travelers, thanks in large measure to its flag carrier. For years, Icelandair has marketed its home country as much as, if not more than, itself. And the all-Boeing airline has used its geographic "sweet spot" to build an incredibly successful airline during one of the aviation industry's worst global downturns, even achieving record profits in 2004. In February, it became the first European flag carrier to launch the Boeing 787 Dreamliner. The same month, it signed an agreement to acquire Iceland's Bluebird Cargo in order to grow its international transport and charter business. In January, Icelandair's parent company, the FL Group, announced its purchase of 10 Boeing Next-Generation 737-800s, which it will lease to other carriers beginning in 2006. It then followed with an order for five more 737-800s in April. Late last year, it purchased a 10.1 percent stake in European low-cost carrier easyJet as an investment. And this month the airline will extend its May-to-October seasonal reach to San Francisco, flying a leased Boeing 767 for the first time. Despite its success, the privately owned airline and travel investment group continues to evolve. 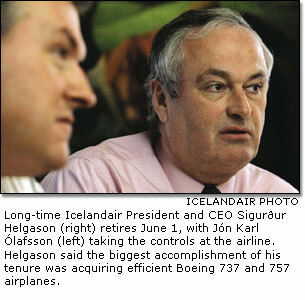 Long-time President and CEO Sigurður Helgason will retire June 1 after piloting the airline for 20 years. Building on Icelandair's incredible growth is its new leadership team, headed by Executive Chairman Hannes Smárason, that's bringing new ideas to the table. And just as it has for the past three decades, Boeing is working in partnership with Icelandair, helping support the ambitious carrier's plans for continued growth and profitability. Ask members of the Icelandair leadership team what's helped the airline achieve its enviable success, and they mention the Boeing 757 fleet that's been the backbone of their company since the airplane first arrived there in 1991. In fact, the turning point in the airline's future came, Helgason said, once the airline exchanged its DC-8s and 727s for efficient 737 and 757 airplanes. Helgason said the overhaul is the biggest accomplishment of his 20-year CEO reign, as "that made it possible to build up a hub and network and build up tourism in Iceland." Helgason said that Borge Boeskov, the legendary, half-Icelandic former Boeing vice president of sales in Europe, told him: "'Siggy, if you're going to run this airline, you better get some new planes.' 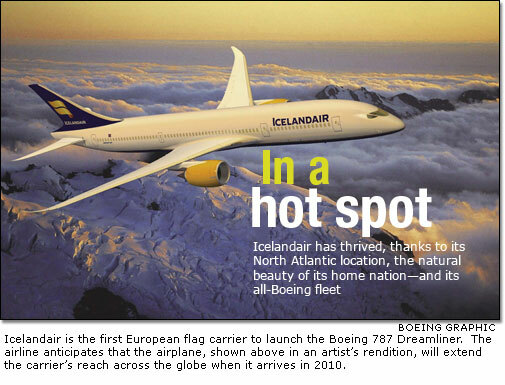 Borge was very instrumental for Icelandair in renewing its total fleet and getting us to where we are today." "Boeing's relationship with Icelandair has always been built on mutual respect and trust," said Marlin Dailey, vice president of Sales for Europe and Central Asia, Boeing Commercial Airplanes. Dailey served as Boeing sales director for Icelandair from 1994 to 1999, and has been involved with the airline's account in various capacities before and since that time. "Iceland's geographic location has allowed Icelandair to build a natural bridge to and from Europe, but it also provides some operational challenges. Their business model has evolved and changed over the years, and it has been a rewarding experience to be part of this dynamic growth and development. "We've really worked hard to find airplane and services solutions with Icelandair's interests as a primary objective," Dailey added. "They've needed support from us and we've been there for them, and vice versa. Sustaining that tradition of customer service has always been a vital element of our relationship with Icelandair." Today, Mark Norris, Boeing sales director for Northern Europe, spends significant amounts of time in Iceland. Like his predecessors, he's become like a member of the airline's team. "A big part of it is understanding what they're trying to accomplish and how Boeing can help play a role in realizing their goals," he said. Dailey said the 757's ETOPS (extended-range twin-engine operations) capability, developed with Icelandair in mind, is an example of how Boeing strove to make its airplanes the preferred choice for the airline. That capability allows Icelandair to fly over water and serve 22 destinations in 10 nations from its hub in Reykjavik, Iceland's capital city. "Boeing has had exactly the right aircraft for us, the 757-200 and -300," said Halldór Vilhjálmsson, Icelandair's senior vice president of finance. "The utilization is very high, and we have not found another aircraft that can do it better." Although most airlines felt the economic impact of the 2001 terrorist attacks on the United States, Icelandair weathered the storm by immediately rightsizing itself. It dropped unprofitable routes, cut seat availability on its international routes by 18 percent for the winter and 11 percent for the summer, reduced its fleet size, and trimmed its airline and travel subsidiary workforce. These steps paid off, as the airline was profitable just one year later. Now, it has a robust cash flow that's permitted major purchases such as the 15 737-800s—the first time FL Group bought new airplanes with the intent of leasing as part of its strategy to grow its business outside Iceland. The airline occupies a unique niche in the global aviation industry, as it's adopted the marketing of its home country as part of its own growth strategy. "We have to sell the idea of coming to Iceland," said airline CEO Jón Karl Ólafsson, who previously headed operations for subsidiary Air Iceland after an earlier stint at Icelandair. "We have probably been to some extent instrumental in making Iceland 'in' and making people want to come visit. Gradually after 1995—by increasing frequency and destinations—more people were coming." "They kept a focus on costs and tied it into the Icelandic tourism aspects, so they put Iceland and the culture on the map," said Richard Aboulafia, an aviation analyst and vice president of the Fairfax, Va.–based Teal Group. "Because of that stopover (in Reykjavik), it allowed them to operate relatively low-cost airplanes like the 757. It's a nice geographic advantage." And while the current fleet has linked North America and Europe, the 787 will extend the airline's reach across the globe when it arrives in 2010. "By buying these airplanes, we are thinking about the future," said Smárason. Flying this airplane, "If they want to do the same stopover model in Iceland for South Africans or Middle Easterners—or conceivably, Asian travelers—they can do it. The 787 really opens up the world to these 'sixth freedom' airlines," Aboulafia said, referring to the rights that allow carriers such as Icelandair, Singapore Airlines and Dubai-based Emirates to transport other foreign airlines' domestic traffic through their own national hubs. "You have markets opening up like China and Japan," Ólafsson said. "There seems to be a very big interest (in Iceland) in those markets." At the end of May, the group's new leadership team will settle in, with Ragnhildur Geirsdóttir officially taking over CEO duties for the FL Group and Ólafsson doing the same as CEO of Icelandair. Even though he'll retire, Helgason will continue serving as an advisor and consultant to the board, while Smárason will focus on expansion and business development. The new team's goal, Geirsdóttir said, is to maximize the value of the FL Group's businesses and investments. Hence, the acquisition of Bluebird Cargo, a primarily international carrier which flies five 737s and will introduce a 757 into its operation this spring—and the stake in easyJet. With regional sales offices stretching from the United States to Denmark to France, Icelandair is poised to continue its growth. If the Asian tourist market keeps swelling, Geirsdóttir said, perhaps an office in the Far East will follow. For the island airline that makes no small plans, the future's wide open indeed.